In Japan, the ancient tradition of enjoying the beautiful but ephemeral blossoms of cherry trees is called hanami, which literally means “flower viewing.” Generally, this term refers to the flowers of several species or cultivars of ornamental cherries (sakura), in the Prunus genus. The most common variety is the Yoshino cherry (Prunus x yedoensis), which can be seen all over Japan and at the Tidal Basin in Washington, DC. There are a small number here at Brooklyn Botanic Garden as well. As early as the Nara period (710–794 CE), people in Japan celebrated the arrival of spring with cherry and plum (Prunus mume) blossom-viewing parties. Members of the imperial court at that time would gather to appreciate the fleeting beauty of the delicate pink and white sakura. 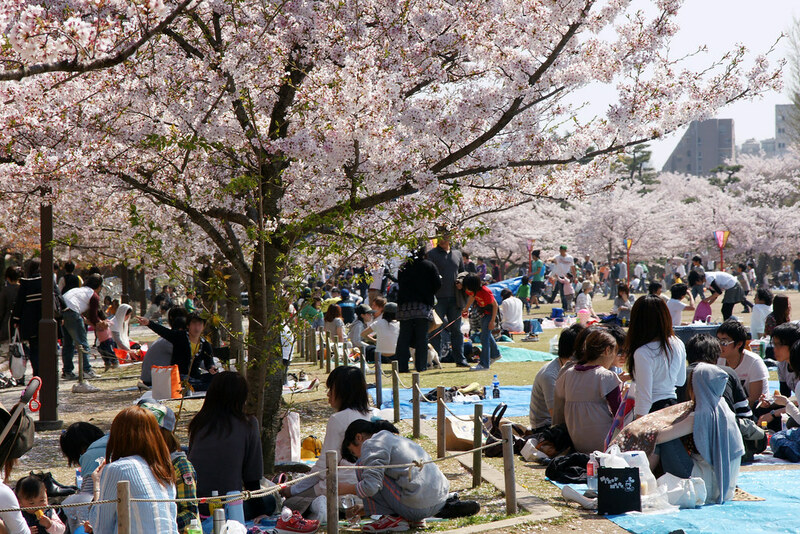 Today, people from across Japanese society congregate under the cherry trees to informally enjoy food, drink, and perhaps music with family, friends, or coworkers while sitting on plastic sheets or picnic mats spread upon the ground. The best spots for blossom viewing are in high demand, and the competition is stiff. Many workplaces send the new employee or intern to stake out a good location early in the morning or even the day before. Some companies offer volunteers a half day off work to reserve a spot. Families and groups of friends also arrive at parks to reserve a nice patch of ground for later. In the afternoon, people leave work or home to gather around the trees, bringing with them ample treats for a relaxed picnic. 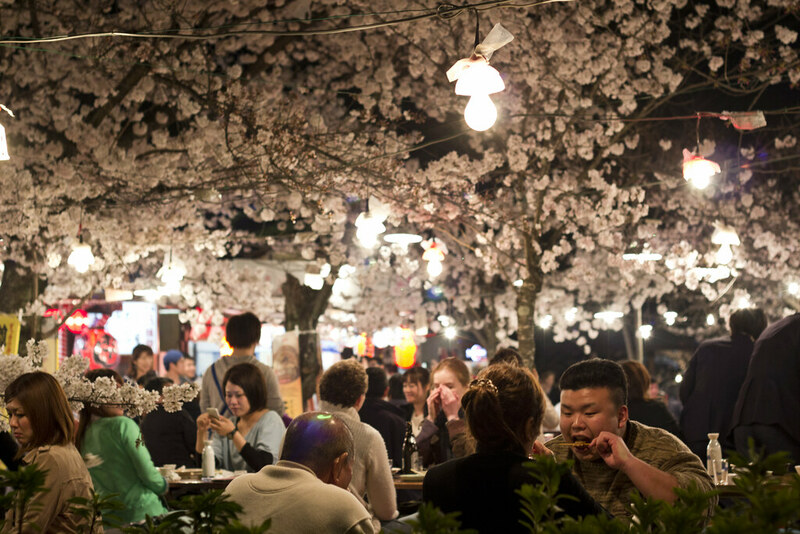 A Japanese cherry blossom festival, or sakura matsuri, in contrast to these more casual hanami traditions, is a modern, commercial invention catering to tourists. Here you’ll find food stalls and occasionally traditional music and folk dancers in a festive atmosphere. These events are still smaller in scale than the extravagant production here at Brooklyn Botanic Garden and other U.S. festivals. 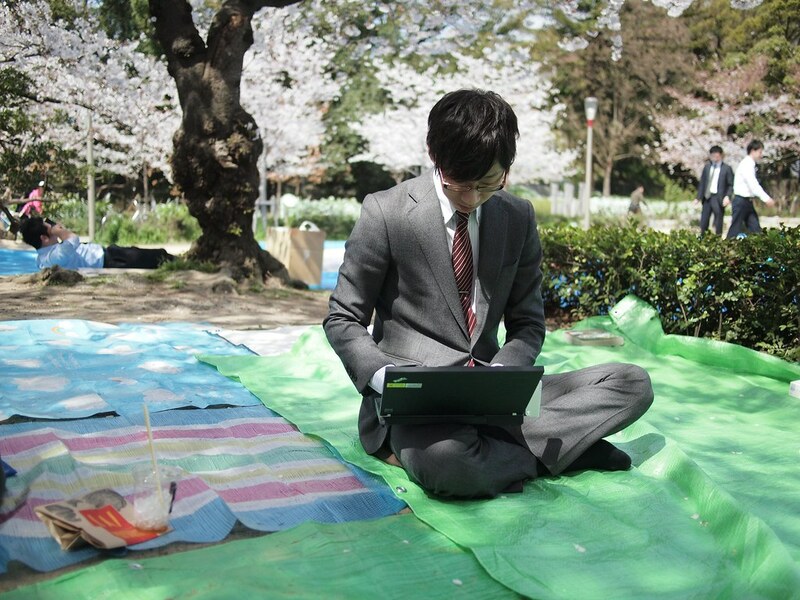 In Japan, cherry trees are rarely found in traditional gardens, where sitting on the ground would be very inappropriate. Instead, the best displays are in parks, on riverbanks, or on the grounds of medieval Japanese castles. These locations do not have lush green lawns like those of BBG's Cherry Esplanade, where tarps and blankets could kill or damage the turf, so people can sit where they please. Still, almost no one would disrespect the cherry trees by climbing them or breaking their twigs; doing so would also likely incur stiff penalties. Even more so than in the United States, flowering cherry fans in Japan eagerly await the first blooms and try to predict how the season will unfold. Each year, the cherry blossom front, or sakura-senzen, forecasts and maps the progress of the first March blooms in Okinawa, in southern Japan, through the wave of flowers northward to Hokkaido in May. The timing varies every year, depending on the weather, just like at BBG, so people pay close attention to the forecast to plan their flower party. The anticipation just adds to the excitement. Evening festivities in Maruyama Koen in Kyoto. Photo by Japanexperterna.se. Staking a claim on a spot. Photo by whity. 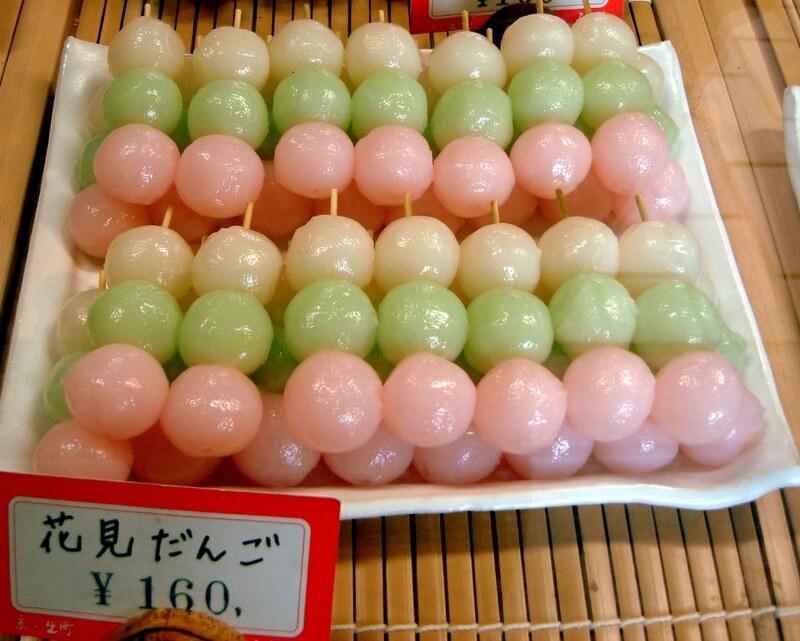 Hanami dango. Photo by gochie. 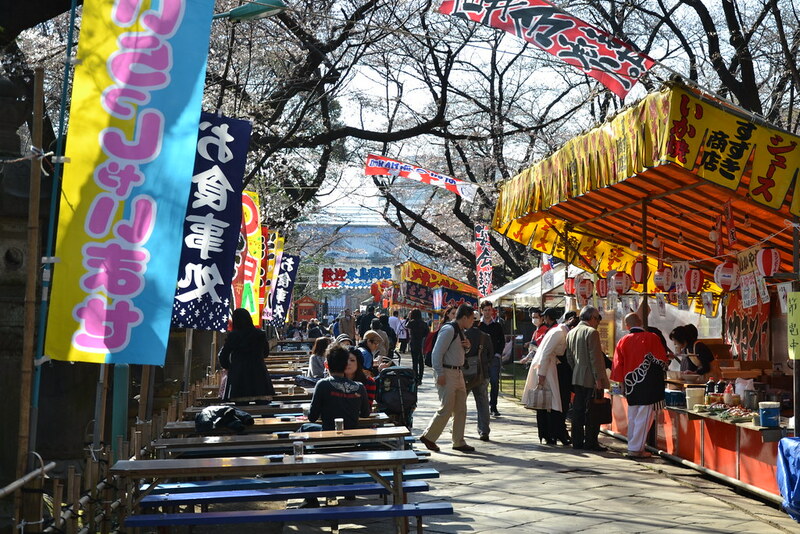 Food Stalls in Ueno Park in Tokyo. Photo by Tomi Mäkitalo. Picnicking on the grounds of Himeji Castle. Photo by 663highland.